THE outstandingly beautiful island of Taransay, made famous as the setting for the television series, Castaway, is shortly coming to the market through the Inverness office of leading Scottish property consultants, CKD Galbraith. Located in an exceptional setting in the Outer Hebrides, Taransay is made up of two islands connected together by a peninsula of sand, with spectacular white sandy beaches, rugged cliff faces and heather moorlands forming its remarkable and unspoilt landscape. Says a spokesperson: “Taransay has been inhabited since about 300 A.D. when it was home to Celtic pagans. Throughout history it has been the site of fierce battles including the Massacre of Taransay in 1544, when the Morrisons of Lewis invaded. “At one time, there were three villages on Taransay, but the population dwindled, with the last remaining family moving to the mainland in 1974 when the island became mainly a place for sheep grazing. The traditional farmhouse has been recently refurbished and combines comfortable modern accommodation with truly outstanding views across the beach. The old school chalet has also been upgraded to a high standard with open plan accommodation overlooking the bay, whilst the bothy offers more basic accommodation, ideal for a group of up to ten. The island also offers the country sportsperson an abundance of activity whilst protecting the biodiversity of the island, with hill lochs teaming with brown trout, first class coastal and sea fishing, as well as a herd of around 200 head of red deer providing some enjoyable and sustainable stalking. In addition, the farm on the island is in hand and the extensive grazing supports around 680 breeding ewes and followers. John Bound, of CKD Galbraith, said: “If you’ve ever dreamt of owning your own island paradise, then the Isle of Taransay has it all to offer. The island extends to approximately 3,445 acres and is owned in its entirety. The current owners are prepared to consider including in the sale a small land area on the sea front of South Harris, to act as a land base for a boat hut and compound from where a boat can be launched to Taransay. 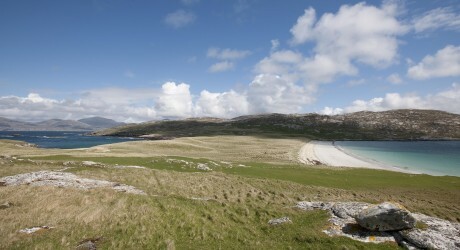 Offers over £2million are being invited for the Isle of Taransay. Picture caption: Isle of Taransay. More images are available on request. Please contact Lorna Gardner or Gary McQueen at Media House on 0141 220 6040 or email: lorna@mediahouse.co.uk / gary@mediahouse.co.uk. For further information on the Isle of Taransay please visit www.ckdgalbraith.co.uk or contact John Bound of CKD Galbraith on 01463 224343 / email john.bound@ckdgalbraith.co.uk. MEDIA RELEASE posted by Media House International. You too can post media releases (aka press releases) on allmediascotland.com. For more information, email here.